The small problem is the lack of vertical space, the main toolbar has fixed height and is too high, you can't access the color swatch at the bottom or the useful tools in the status bar. The bigger problem is that the maximized window do not fill (horizontally) the screen. You have to unmaximize it and resize manually. And do this each time you start the application, as it does not remember the window geometry. heathenx just fielded a question citing the same vertical height problem. Although you likely know this already, the fix for this limitation is in the 0.46+devel versions right now. 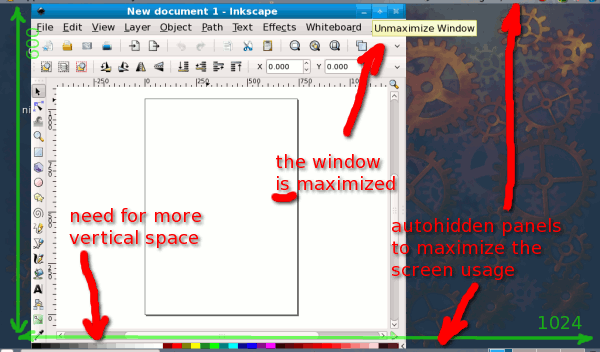 So 0.47 will alleviate the minimum Inkscape window height problem. That is a problem with the long release cycles: always you have to jump to the development branch somewhere in the middle of the cycle due to a major bugfix like this or a compelling new feature. Now if it would be possible to customize the left toolbar and remove one or two icons I rarely use, Inkscape would be perfectly usable on small screens. On KDE3/KDE4 you are able to save properties for a window class or a single application. This does also include initial size and position of the application, among many many more options. That's really handy, can't gnome do something like that? I think GNOME can do save the windows size if the applications are cooperant (it works for Agave but not for Inkscape). As for placement, it seems that the default in Metacity is to provide what it thinks is "the best placement". Depending on whether or not you're making much use of the keyboard, could you possibly use xrandr to rotate the display and use it in portrait mode? I thought about that too, but the keyboard is important when working with inkscape: keep Ctrl pressed to keep the aspect ratio while resizing, use the numeric keys for various zooms and many other useful shortcuts. Then you click the window you want to resize. I think xwit is in most repos. It might or might not be useful for you.